This pciture is taken probably by the end of the war when really young and old citizens were enlisted for soldiers. 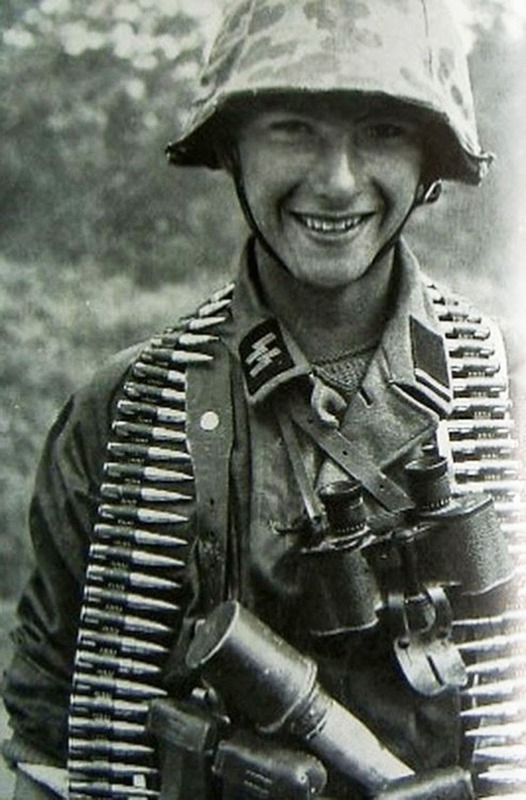 Most likely a member of the 12th SS Panzer Division “Hitlerjugend” which sustained 43% casualties during the Normandy campaign. SS recruiters for the division accepted boys as young as 14 into the ranks. Also by judging from the helmet cover he has on, it looks to be the “pea” pattern cameo type which did not show up until late ’44/early ’45. Most likely the location is in France. Some interesting stories about for 12th SS Panzer Division “Hitlerjugend”. The young recruits were given rations of chocolate and coco (if available, or just chocolate milk) instead of cigarettes and alcohol. In training, drill and marching was completely ignored, and instead all available time was spent on combat training, weapon maintenance, tactics, etc. There were several reasons for this, one obvious reason is time constraints. The division had to be operational in the shortest amount of time possible. Ready for the coming allied invasion of France. Other reason being, the core cadre of the division, the officers and the NCOs, were almost all veterans of the eastern front, and other major campaigns. Even for the German army at the time, ignoring military drill was out of the norm. During combat the soldiers of this divisions were fanatical as reported by many allied accounts and German ones. They solely held open the Fallaise Pocket long enough for tens of thousands of German soldiers to escape the encirclement. German General Kurt “Panzer” Meyer’s autobiography is a fascinating insight about 12th SS Panzer Division “Hitlerjugend”. In on of the passages he describes the final moments of one of the young recruits in battle. The soldier was trapped in a trench that was being ground down by the tracks of a Sherman. With no hopes of escape the soldier grabs his panzerfaust, with a smile on his face, waves his last good bye to his commander, and fires the panzerfuast at the bottom of the Sherman. Just the imagery of this is horrifying. A recommend book on this topic is The 12th SS: The History of the Hitler Youth Panzer Division – Volume 1 and 2 by Hubert Meyer. A bit more technical, but contains a lot of after action reviews on many of the battles fought by the division. The 12th SS Panzer Division Hitlerjugend suffered a total of 8,569 casualties out of a strength of 20,540 men; a casualty rate of 43%. It had also lost 94% of its armor and almost all of its artillery. He's not 12th-SS. Dot44 pattern was never produced into helmet covers, only tunics and trousers. He's actually wearing an SS-VT block pattern, which is very early war. My guess is France, 1940. Just beneath his binoculars we have what looks like a large microphone. It's a Stielhandgranate, aka "potato masher" hand grenade. I'm going too say 12th SS in Normandy. Although the helmet and smock are plane tree camo which was used throughout the war. So too say this is early war based on that is ridiculous. He looks like a sturmann equivalent to an e-3 in most armies and an assistant gunner as well for the mg-42. We can look at his 98k pouches on his belt plus the binos, and the extra ammo he is carrying around his neck and in ammo cans.